Move and reposition two large, potted plants easily with these Gardman Black Extra Heavy-Duty Plant Caddies. These two, hardy caddies can each hold a square, oval, or round planter with ease. 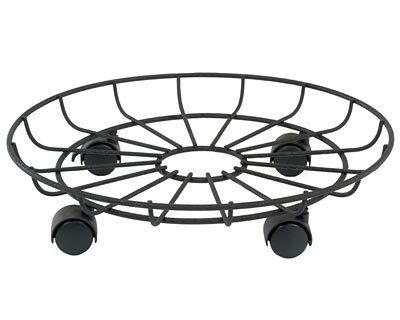 Durable, metal rods create each caddy, and each rod extends and attaches to an interior circle for extra strength and style. Four casters on the base of each unit remain connected through these rods, and one caster locks in place to keep your plant at a fixed position. The generous base of each unit holds a potted plant with a 15" diameter or smaller base, and their sturdy metal construction can each accommodate a large plant. The durable epoxy finish withstands years of use, and the black color of each accents any setting. Easily maintain and display two large planters on your deck or in your sunroom using these Black Extra Heavy-Duty Plant Caddies. Note: This case pack includes 2 of the Gardman Black Extra Heavy-Duty Plant Caddies, 16" dia.